My friend, Christa, picked the theme for this week. As you can already tell it was Butterflies! 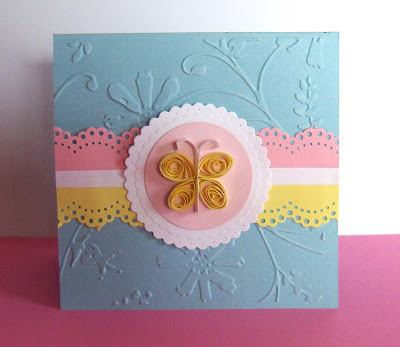 Another quilled card -- this time the flowers are quilled and the butterflies punched. An extra simple shape card. I was still in "getting started" mode here. 1/2 Sheet Amplified Monster Ballad (American Crafts) -- Who comes up with these names??? 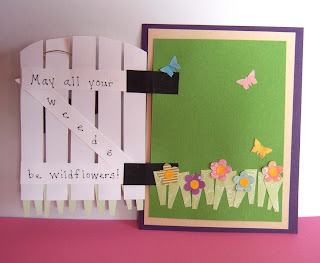 Another very fun card to make. 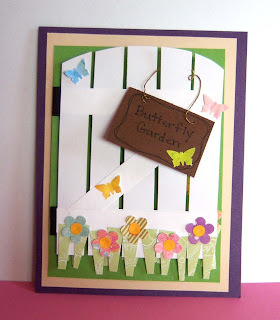 I started with the black butterfly base (cut from a pattern) and added a dictionary page to that. Traced around the edges with a pink marker, added a scallop "flower" to the center, crochet flower on top of that, and heart button (with pink fiber tied in it) on top of that. 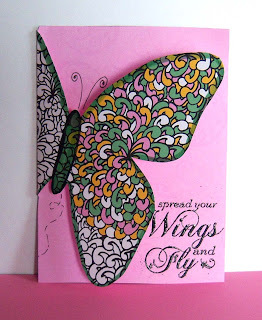 The card base is a piece of white cardstock brayered over with pink and green ink. 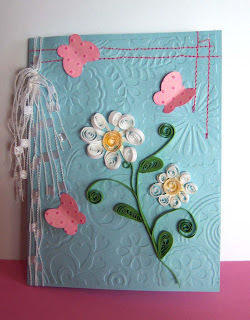 Then covered with versa mark and Kaleidoscope embossing powder added to the top. 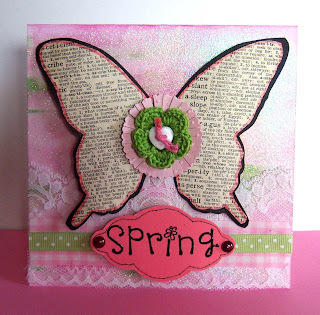 Wide lace, pink gingham ribbon, green polka-dot ribbon across the bottom and a little spring tag (Craft smart stamp) popped up with dimensionals -- edged with dew drops. To make the faux stitching I used a paper piercing tool and pierced holes around the tag, then I traced around it with a fine tip felt pen. So much fun!!! I really think this theme could be revisited sometime as I ran out of steam before I ran out of ideas! 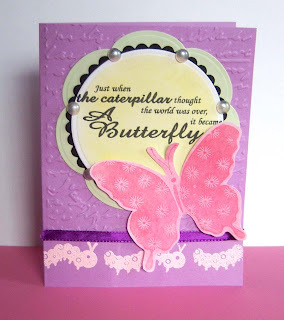 Now you can visit Christa's blog and see her Butterfly creations for this "I Challenge You" Wednesday.....enjoy!